We couldn’t agree more. Bags are not just functional tools meant to contain your essentials; they can add texture, visual interest and dimension to our outfit, and are very much an important accessory just like jewellery. With so many styles and hues to choose from, things can get overwhelming. But you can’t go wrong with these. 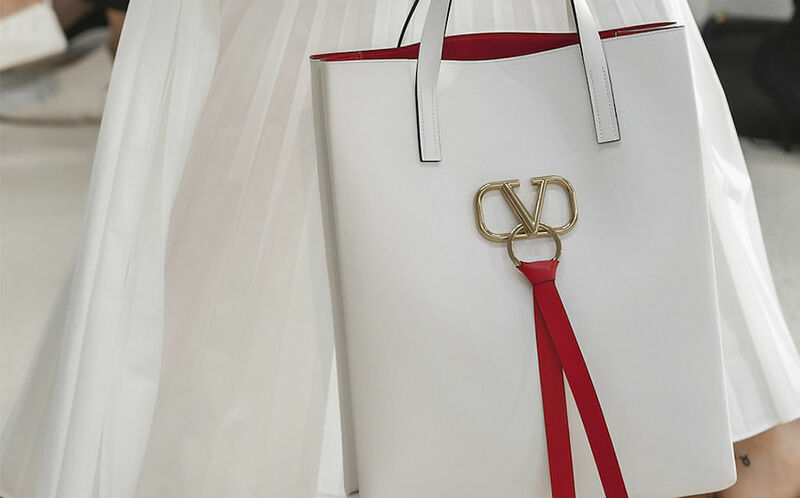 Below, we’ve curated a list of the seven latest luxury designer bags that have been introduced in the S/S'19 collections. Full disclosure: We’re absolutely obsessed with them. Add style and functionality to your work wardrobe with these pieces now. Blending heritage and modernity, Cartier’s latest addition, the Guirlande de Cartier bag, draws inspiration from the signature red boxes they use to contain their jewellery and watches. Fashioned with calfskin and adorned with its iconic golden wreath that was introduced in the 18th century, the bag can be worn as a handbag with the top handle or as a shoulder or crossbody with the adjustable and detachable shoulder strap. Seeing you through work and play seamlessly, this versatile creation is available in three sizes (mini, S and M) and four colourways (red, black, emerald and camel). We suggest juxtaposing the boxy, sculptural lines of the Guirlande de Cartier against a softer, feminine silhouette of a lace or ruffle dress. Finish that look with slinky, strappy heels. Paying homage to the traditional art of whip-making, Givenchy’s new bag, aptly named the Whip, is a blend of tough and militaristic details found in traditional whips, such as leather braiding and knots, with a modern design that incorporates smooth leather, metallic rings and hand-knotted leather tassel. Created in two styles — a belt bag and a handbag that comes in three sizes (S, M, L) and can be worn either as a shoulder or crossbody — the Whip is made in seven colours to fit your wardrobe styling needs (black, white, pale coral, pistachio, natural, yellow curry and taupe). Let the handbag shine and go with a simple white shirt French tucked into palazzo trousers. Not only did Riccardo Tisci redesign the Burberry logo since taking over creative reins of the fashion house, he also released an entire bag range as part of his debut collection with the English luxury label. 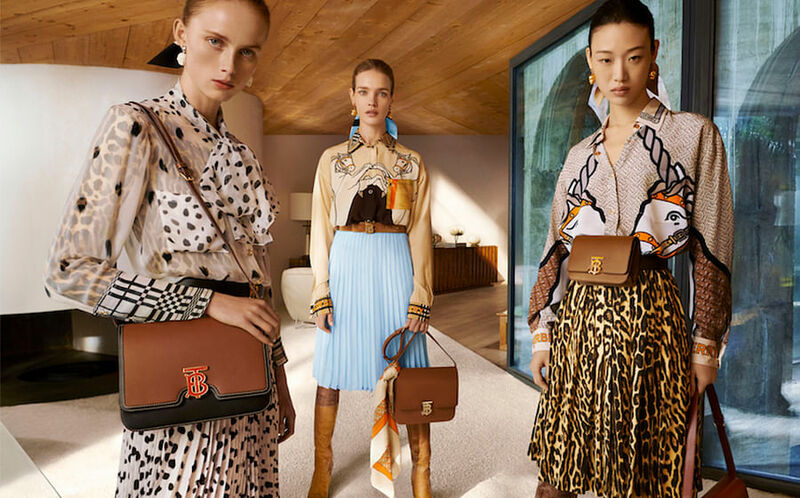 The TB bag, which references the initials of the brand’s founder Thomas Burberry, comes in three designs: A shoulder/crossbody, a bum bag and an envelope clutch. The seemingly simple silhouette however, is juxtaposed against a myriad of colourways (32 to be exact), from deeper hues of black and dark brown to softer tones of pink and pistachio. But that isn’t all, there are bicolour options and different clasp colours for you to pick from too, not to mention pieces with monograms and logo prints. 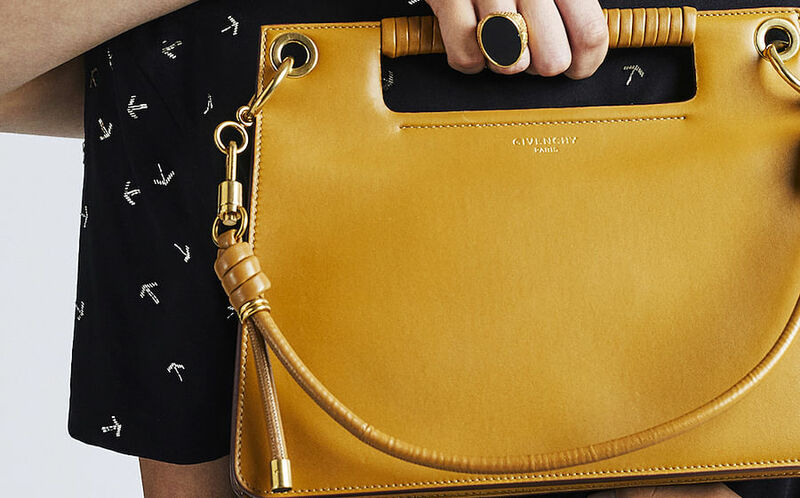 We love how work-appropriate the shoulder bag is. You can pair the boxy silhouette with a turtleneck sweater and tailored trousers for a professional aura. Designed by Pierpaolo Piccioli, the new VRing bag is Valentino’s answer to an it-bag that can carry you through various social occasions. 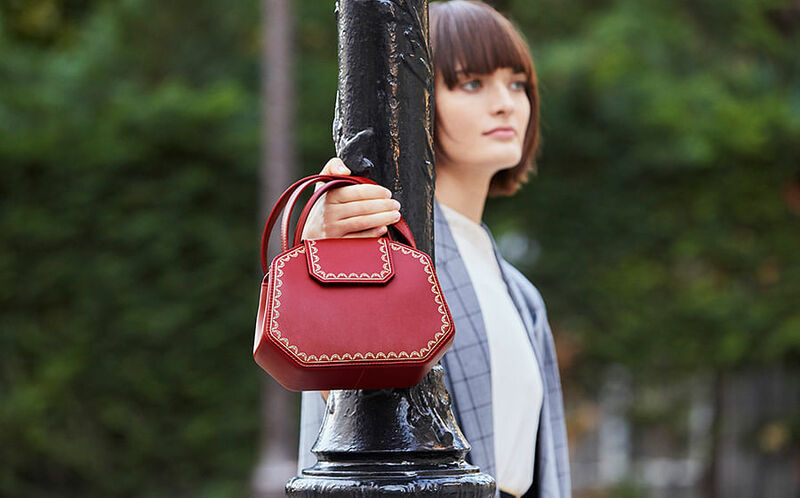 Made with smooth calfskin and nappa leather lining, the VRing comes in four designs — a shoulder, a chain bag, a shopper and a crossbody — and each comes with its own colourway (of black, red or white), and are adorned with a grosgrain ribbon and an antique brass finish V-shape hardware that takes inspiration from a logo from more than half a century ago. We suggest going with the shopper/tote style that comes in a neutral black or white colour as it can fit your laptop, papers and everything you need to be ready for work. Just finish with a killer jumpsuit and boots. 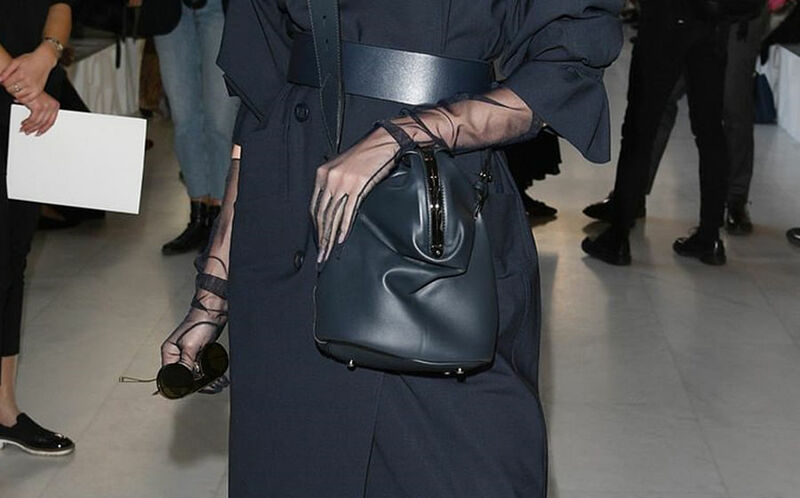 Though this new Max Mara bag design only dropped recently with their S/S’19 collection, it has quickly become a street style favourite and has been seen on models and influencers such as Hikari Mori and Mary Leest. And it is not surprising as this stylish design interplays a contemporary balloon-silhouette bag with a stylish vintage-inspired clasp. Available in two sizes (clutch bag and leather bag) and seven colourways, this bag is perfect for casual Fridays if you’re planning to go from boardroom to bar. Take off your blazer and show off your plunge back dress, and the bag of course, while you enjoy after hours drinks with your closest girlfriends. If you belong to the group of people who manage to find time and energy to go to the gym before or after work, congrats, because 1. you’re amazing and 2. the new Marc Jacobs Foil Tote is a great size for you. This shiny foiled tote available in metallic pink, gold or silver, is not only a statement piece, it can fit your gymming essentials, your laptop and your everyday staples. The shiny quality, we might add, is also a reason to ditch accessorising too. Finish with a sharp A-line dress and block heels to portray a girlish and fun vibe. Known for his penchant for celebrity muses, Gucci’s creative director Alessandro Michele tapped on American experimental musician Zumi Rosow for this season’s bag inspiration. Fusing two emblematic designs from the label, the horsebit and interlocking G logo, the Zumi is a structured yet feminine alternative for lady bosses who fancy a dependable yet stylish briefcase. Available in multiple colourways and in two types of leather (smooth and grainy), the Zumi would match with your fierce tailored pantsuit ensemble. You can even play up the leather elements by belting the pantsuit with a statement belt and finishing with ankle leather boots.